Posted on September 20, 2017 September 25, 2018 in Birthmother Experiences. Birth mother’s think about having an adoption plan for many different reasons. When Amy found out she was pregnant with her 5th child, she knew that parenting another child was not something she felt she could take on. Between meeting the needs of her 4 children in addition to her work schedule and struggles she was already facing, Amy reached out to Everlasting about beginning her adoption plan. 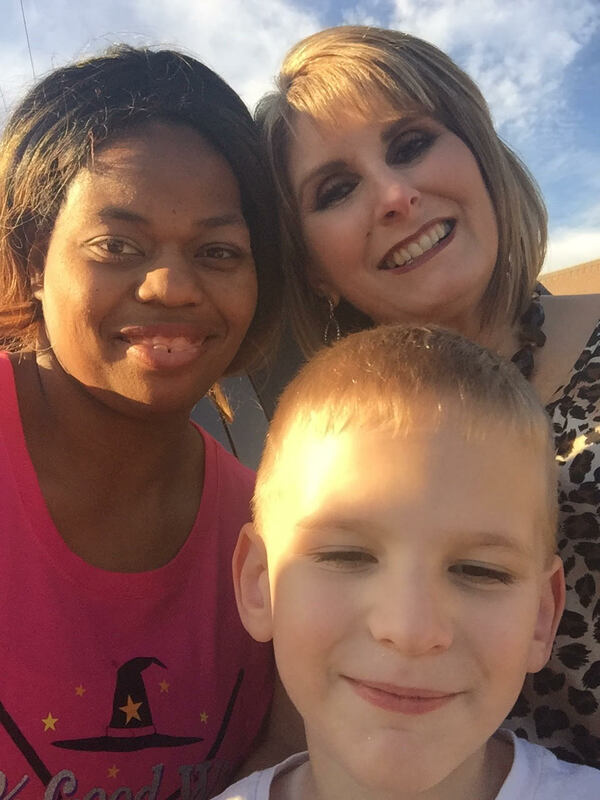 Amy said that the path she had chosen for her son was rough, but it was worth it when she connected with our adoptive parents, Sonya & Roderick. No one would be able to predict the similarities that her baby boy and adoptive father Roderick had in common. Not only was Roderick adopted, but he was also the 5th child, just like his son Apollos. While Amy worked through her plan, she said that she felt supported by the staff at Everlasting and felt that they were always transparent and honest about the process and their families. She absolutely fell in love with Sonya & Roderick and felt their loving personalities from the start. 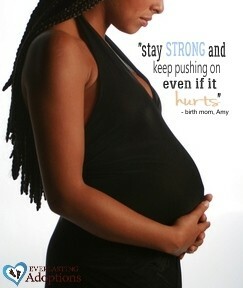 If Amy could give one piece of advice to other birth moms, it would be to stay strong and keep pushing through even if it hurts. At Everlasting, we truly care so deeply for our birth mothers and are grateful to have been a pillar of support for Amy during her adoption. Posted on April 14, 2017 in Birthmother Experiences. Meeting a birth mother for the first time can be overwhelming and exciting. When Jessica and Jonathan connected to their birth mom and learned that their birth mom was only a short car trip away, they immediately began planning their first visit to meet her. They planned a lovely day of meeting their birth mom, Lucia, as well as her son and her son’s aunt. After a trip to Lucia’s favorite burger place, they picked out some maternity clothes and then ended the day with a sweet treat! Jessica described this day as perfect. 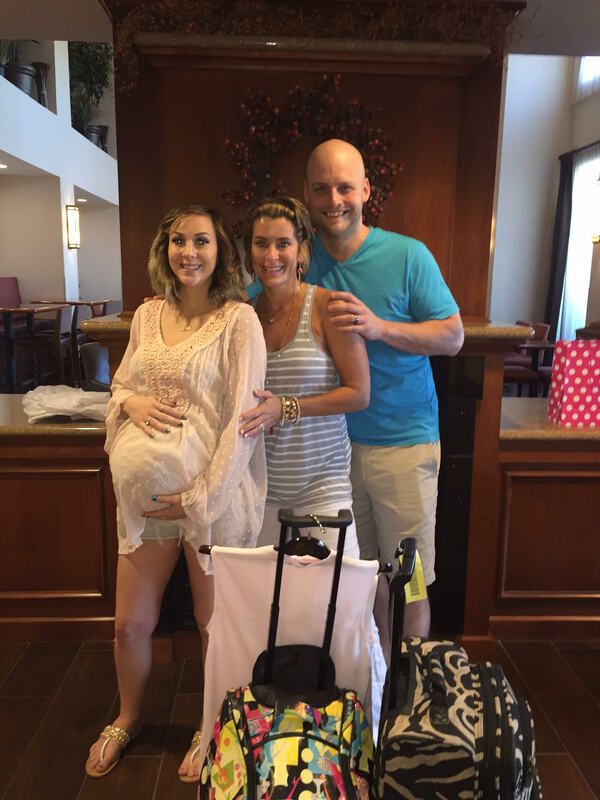 They enjoyed getting to know each other and laid the foundation for their growing family and we’re already planning their next visit! Lucia had mutual feelings of joy! She expressed feeling relieved, along with a sense of peace and contentment; she now had confidence in her decision to move forward with an adoption plan! Concerns that she couldn’t find a family she would trust, melted away after getting to know Jessica and Jonathan. Posted on March 16, 2017 in Birthmother Experiences. Brittany reached out to Everlasting in August of 2016 when she found out that she was pregnant. Brittany has had experience with adoption before and we treasure the opportunity to help her work through an adoption plan when she was faced with the difficult decision once again. She did not feel like she had the stability to parent a child and yearned to find a family that could provide that love and consistency she desired for her baby. Brittany connected with adoptive parents Kristina and Robert. She felt drawn to them because of the security she felt they could provide. She loved that Robert has a great job and that Kristina is a stay at home mom. The icing on the cake was the fact that her baby would have a big brother! When asked about her experience with her adoptive family, Brittany used one word: AMAZING! She said it takes her breath away to interact with them. They still talk regularly! Brittany said that she was immediately drawn to our variety of families that she could choose from. Her experience with our director, Carol, an adoptive mom herself, was wonderful. Brittany felt supported and that her needs were always listened to. Carol provided constant love, attention and was always overjoyed and happy to hear from Brittany. We are grateful to Brittany for sharing her experience with her adoptive family. To have supported her along her journey, providing strength and love, was an honor and a privilege for everyone at Everlasting. We wish her and her adoptive family nothing but love. Thank you, Brittany! Posted on March 14, 2017 in Birthmother Experiences. When Jennifer and her husband found out they were pregnant with their 5th child they knew in their hearts they could not keep her. As much as they desperately wanted to, they already had 4 beautiful children under the age of 8 and they felt it wasn’t fair to any of their children to parent a 5th child. They felt adoption was the best chance to give all of their children the lives they deserved. Jennifer contacted Everlasting in August of 2016. Our director, Carol, shared her personal experience of adopting their son with Jennifer. This sharing instantly connected Jennifer with Carol, and reassured her that her experience was personally important to not only Carol, but everyone at Everlasting. Carol helped Jennifer find the adoptive couple that was the right fit for her family. Jennifer said that she met Scott and Kirsten for the first time over dinner, and after that, they texted almost everyday. When it was time for delivery, they all rode to the hospital together! Jennifer delivered baby Tuesday Elise on February 7, 2017. Scott and Kirsten stayed in the hospital with Tuesday where they also spent their downtime with Jennifer hanging out and chatting. Jennifer and her family have such a special relationship with Scott and Kirsten. They talk on a regular basis. They exchange updates monthly. Jennifer and her husband get pictures and updates on Tuesday Elise, and they send pictures and updates back on her siblings! Jennifer said that since their personalities are so similar, they would be best friends if they didn’t live in different states! When asked about her experience with Everlasting, Jennifer said it was great. She stated that anytime she ever had a question, the response was almost instant, and she never felt like she was bothering anyone even if the text or email was in the middle of the night. Jennifer said Carol was amazing! If Jennifer could share one piece of advice with a birth mom wrestling with the decision to have an adoption plan or for a birth mom currently going through one, it would be to remember, no matter how hard it is, you’re doing the best for your little one. 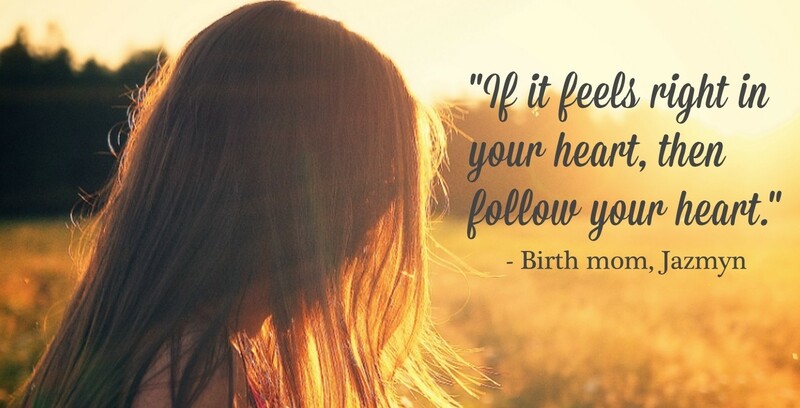 She encourages fellow birth moms to not let anyone make you feel like you’re not! She said that birth moms should also make sure they click with the family they choose and be open and work out details in the beginning; that way everyone knows if they want different things. 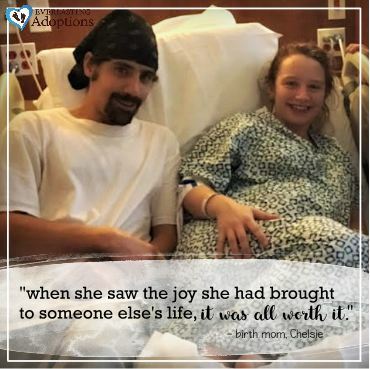 We are grateful to Jennifer and her husband not only for their selfless act of love and the blessing she has given adoptive parents, Scott and Kirsten, but for Jennifer’s willingness to share her story for other birth moms. It is our greatest joy at Everlasting to be part of this newly created family! We wish nothing but the best to Jennifer and her family! Posted on October 7, 2016 in Birthmother Experiences. I would recommend Everlasting Adoptions to anyone looking into adoption as a birth mom or adoptive parent. The staff is incredibly understanding and very helpful through the adoption process. At the beginning of my experience with Everlasting Adoptions I was 4 months pregnant and was just calling around to see what adoption was all about and exploring options. After my first conversation with them, I was told about their online waiting list where you can view profiles of awaiting parents. I immediately explored their website and read through several profiles until I came across Stephanie and Joeys’. Shortly after I reached out to Carol at Everlasting Adoptions, told her I wanted to get to know this couple and very soon after, Stephanie and I were talking via text. I remember the first time I received Stephanie’s text message I was unbelievably nervous. I thought, “This is crazy. What do I say? What if i say too much? “What if it doesn’t work out? What if it does?” but Stephanie and I hit it off very quickly. I was nervous because I had never met anyone online before so I had no idea what to expect, but they were above and beyond what I had read about them on their profile. I was ecstatic the more I got to know them, their life, and their story. I actually didn’t intend to become as close as we were by the time they traveled to my state to meet me in person. I thought perhaps a closed adoption would be a better option and was expecting it to be a difficult experience. However it quickly became the highlight of my day talking to Stephanie and found myself just as excited as she was for Mary Clara to arrive. It was wonderful. Mary Clara’s delivery date arrived and it might as well have been a fairy tale. It was so beautiful. When I handed Mary over to Stephanie in the delivery room for the first time, it was an extraordinary moment. The look on her face holding her baby girl for the very first time was amazing and I just felt so blessed to have been able to be a part of it. Posted on November 25, 2014 in Birthmother Experiences. At the time I got pregnant, I honestly didn’t know what I was going to do. I did know that with having two other kids already (one 5 year old and one 1 year old), that I couldn’t raise my new baby comfortably. I explored my options, and I realized I really didn’t have many. I started to research the internet, and Everlasting Adoptions was the first website that popped up in my search….and the last. After exploring their website, I found Joe and Gretchen’s profile, and liked them at first sight. It didn’t take long for Everlasting to connect me with them. I know I made the correct choice, and it took a lot of courage. Gretchen and Joe were my blessing, and little Maxwell was theirs. Thanks to Everlasting — they helped change my life. Posted on November 18, 2014 in Birthmother Experiences. Thank you, Andrea, for sharing your adoption story with the Everlasting community. Your courage continues to inspire us and so many others! Posted on April 1, 2014 in Birthmother Experiences. I am so grateful that I found Everlasting Adoptions when I did. I am a single mother of three beautiful girls. When I found out I was pregnant, I thought I was happy about it. I was having some minor complications in the beginning of my pregnancy, and needed to be on light duty for a couple of weeks. They would not accommodate me, and then, when my doctor released me with no restrictions, they still would not let me back. So for 9 weeks, I had gone through what little savings I had just to make ends meet. My ex took me to my appointment, and was telling me that I had some serious thinking to do. I had no job, no money, almost lost my apartment, I was getting disconnect notices in the mail, my life had changed so quickly. When I came home I started looking for adoption agencies online. I called Ceal, and I was crying. I knew what I had to do was only for the best. I got contact right away with the adoptive parents. They came up for my first U/S, and I knew right away that they were going to be the perfect couple for my little boy. After the months had gone by, I always kept Ceal and the adoptive parents updated with everything that was going on with my pregnancy. I had him on March 3rd, and it was a scheduled c-section 3 weeks early due to complications towards the end of my pregnancy. He was healthy and no problems. I did spend everyday with Austin, and I wanted the adoptive parents to as well. To this day, I do keep in contact with them, and they tell me what is going on with Austin. I get pictures and videos almost everyday. He is getting so big. I am happy with the decision I have made. Thanks to all that were involved. Christi and Sean are going to be great parents for little Austin, I am thankful and will always have the most respect and love for them.